I am a safe, fun pair of hands. from a wide area: the most successful have shared their own insights and experiences; I myself have mastered the challenge of standing up in front of thousands, keeping the audience engaged with humour at a conference; I have made audiences laugh their hearts out in a comedy show. From the smallest, most confidential space with me and one other, to the biggest of stages with me talking to thousands, I am a safe, fun pair of hands. I play in lots of different worlds: from the expansive corporate world, to the boundless arena of comedy, to the sanctuary of the coaching space. I am an expert and will say things as they are, with a huge level of truth, humour and bravery. I will give insight that others cannot. I draw upon a wealth of experience from a wide area: the most successful have shared their own insights and experiences; I myself have mastered the challenge of standing up in front of thousands, keeping the audience engaged with humour at a conference; I have made audiences laugh their hearts out in a comedy show. Organisations need to rouse their employees and guests. People want their event to be a huge success. I get it. Moreover, I want to create the setting where the speakers can be their best. MCing is a craft and one that I have been mastering for over fifteen years. The sign of a good MC is that everything happens on time and the audience’s expectations are not only met, but exceeded. The speakers have been enabled to perform and engage with a receptive audience, and the organisers are exhilarated by the success of their event. 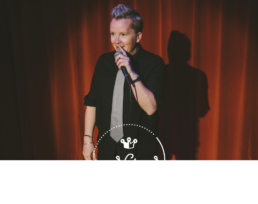 My love of bringing together comedy and my business experience shines through, to help create events and award ceremonies that are brilliant and seamless, as well as stress-free for the organiser. I have been a performer for over twenty years (I started very young!) – acting, clowning, devising, improvising and directing…these have always been my things and I love them. As a performer I have a passion for creating stories that provoke laughter and thought in every audience. In 2015 I co-created and performed my award-winning one-woman show, “Coming Out of My Box”. Now I am researching content for my new one-woman show, which explores identity and what stops us looking at who we are. I will be hidden in a rehearsal room for six weeks in May/June 2019, before taking this show on tour. Inspired by my Musical Theatre training, I am also currently writing a musical…watch this space! People who are seeking to go from great to exceptional. The curious and the brave. Those who are looking to have a different outlook. These are the people that I work with. Through my business, Truth Works, I work with a maximum of 18 amazing individuals per year. By attending our retreats and by gaining 1-2-1 support, you will become the best version of you. I get it. I have delivered a TEDx talk; I am asked to do keynote speeches internationally; I have worked with some of the most talented people in the world to enhance the “how” they will deliver their “what”. Some do not ever want to be speakers, but they know that they want to engage their audiences through the power of becoming and showing the best of them. Curious? Want an exceptional MC for your event? Or a comedy performer who can create something unique for your event? Or want to be the best version of you? Then get in touch. I love to chat! Festival of Doers wouldn’t be what it has become without Emma - a truly inspirational and transformational day for women. She’s the best MC I’ve ever come across and has the ability to set the audience on fire from the start. 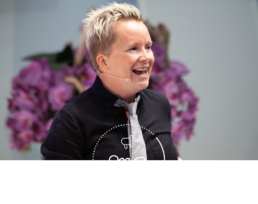 Emma’s style is authentic, genuine, funny, personable and professional and she repeatedly gets great feedback from the attendees of our events. I can recommend her from the bottom of my heart. There is nothing quite like the sense of certainty in knowing that Emma will be MC'ing at a speaking event. You can guarantee the audience will be energised, open and, crucially, smiling. I've been lucky enough to speak at two events with Emma this year. On both occasions, she welcomed me to the stage with funny, conversational patter that meant I could bounce off her and straight into my talk. Highly recommended! Emma takes such a refreshingly different approach to her work that I'm not actually sure how to describe what she does - consultant or coach seems so boring! 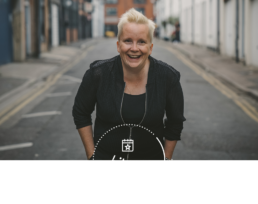 We first met when she ran a session on improvisation for a group of small business CEOs, she immediately became the obvious person to compere at our annual partner conference, and I am currently working with her on a 1-1 basis to enhance my public speaking. 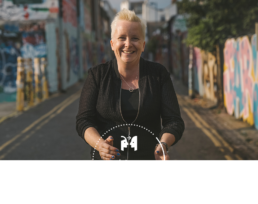 Emma has a special way of helping people get the headspace to tackle challenging topics and backs that up with the accountability needed to make sure they take action.